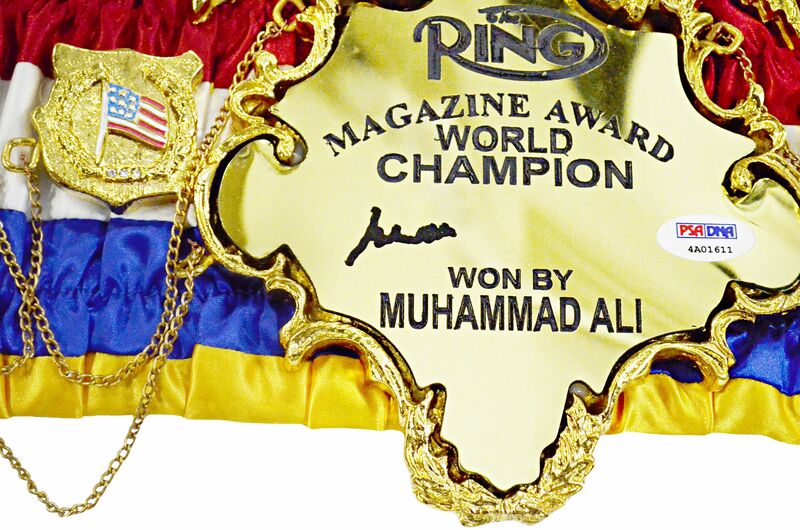 Ring Magazine began awarding World Championship belts in 1922, and awards its belts for winners of boxing matches in lineal fashion, when the man beats “the man.” Belts are not stripped like the official sanctioning bodies WBC, WBA and IBF do if you don’t fight their preferred challenger. .You must beat the title holder in the ring to get the belt. Muhammad Ali was The Ring Heavyweight Champion three separate times for a total of 12 plus years. 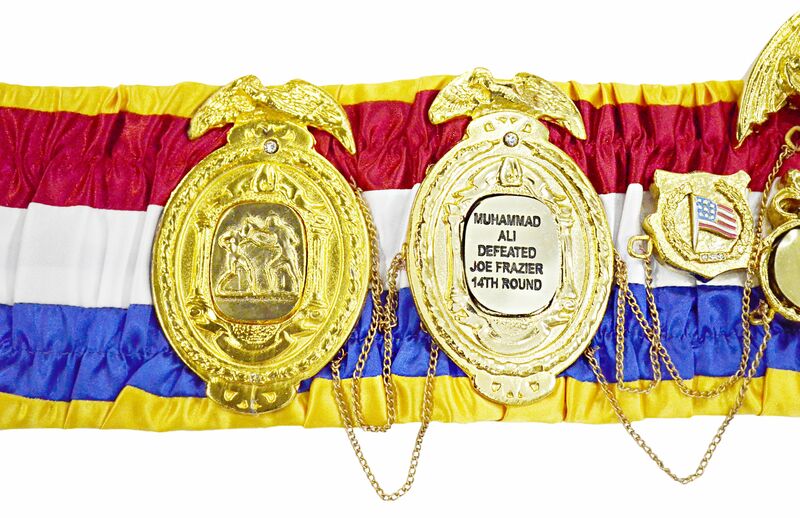 This belt was awarded to Ali after he retained his Heavyweight title with a 14th round TKO over Joe Frazier on October 1, 1975, in the famed “Thrilla in Manila” fight, one of the greatest boxing matches in history. 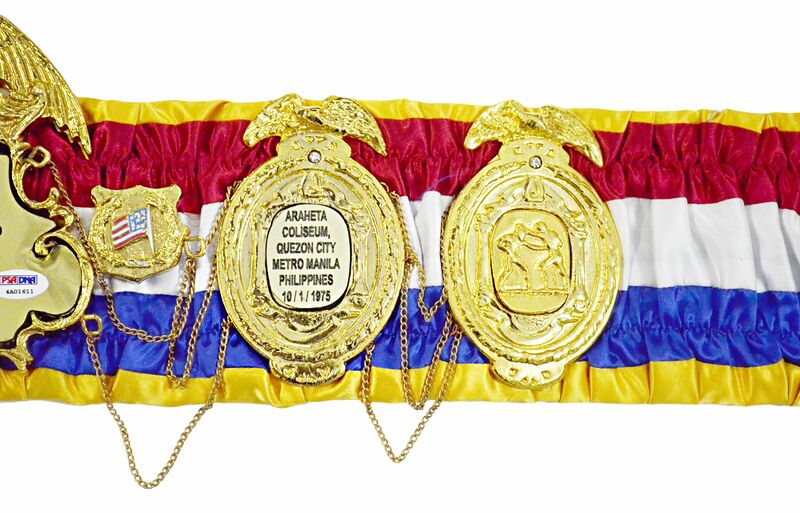 This very heavy belt has a large gold shield bookended by four gold medallions. 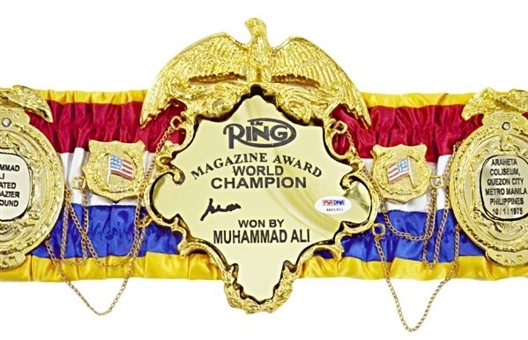 The shield states, “The Ring Magazine Award, World Champion Won by Muhammad Ali” and is signed in black sharpie “Muhammad Ali.” Two medallions describe the results of the fight and the location, with two other having fighters in the ring. All are used in a raised platform. 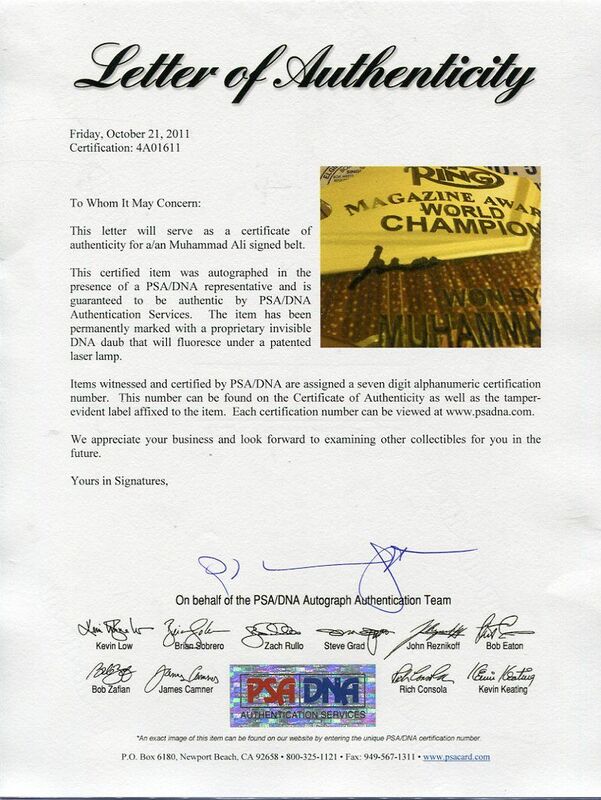 The signature comes with a PSA/DNA letter attesting to the signature’s authenticity. This is a very scarce item, issued to commemorate one of the greatest fights in World Boxing history and signed by Ali. This item is simply The Greatest. Please note this is not the original belt awarded to Ali in 1975 but an authentic belt one produced later by Ring magazine. Auction closed on Saturday, July 20, 2013.